In Bordeaux, the year 2000 has been declared one of the great years of the century. I was in Bordeaux in June for the huge wine exhibition, VinExpo, which occurs every two years and there was a buzz about the vintage of 2000 being exceptional. During a tour of his 17th century Châteaux Lassègue, near Saint Emilion, Erik Freylon pointed out to us the charts of the weather patterns over many years and said that by studying these they had found that the year 2000 had the ideal conditions to make it one of the few really great years of the century. This is very exciting as it gives a really good opportunity to buy wines from this area, right up to the Medoc at a good price now, before they are ready to drink, en-primeur and to keep them for long enough for them to really appreciate both in value and in taste. VinExpo is an absolutely huge exhibition and provides a great opportunity to meet the growers and our current suppliers at the same time. It is always very pleasant to re-acquaint and to try the new vintages. Usually, one or other of them will introduce us to someone new and interesting; that is exactly how we found our superb champagne house, which we now import directly into our warehouse. We also decided to visit some of the vineyards in the Medoc, Saint Emilion and Bergerac regions. Bordeaux is best known for its great red wines; the word Claret is the English word for the light red wines, which were called clairet in French. The area is about ninety miles north to south and forty miles east to west in the Gironde départment in the south west of France. The rivers Dordogne and Garonne merge to form the Gironde, which flows out to sea. 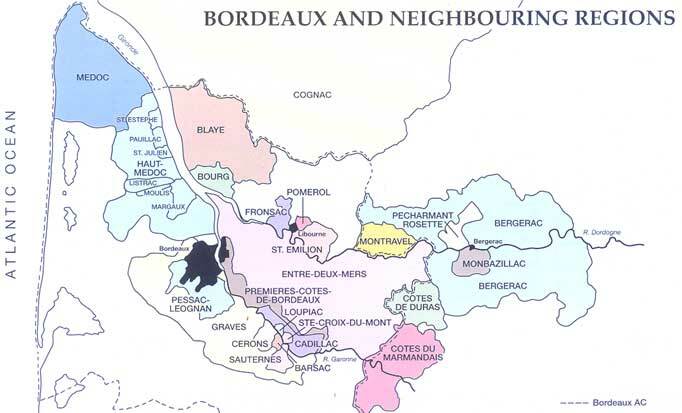 To the west and south are Medoc, Graves and Sauternes and to the north and east are Saint Emilion and Pomerol, but most of the area is the Entre-Deaux-Mers (between the two seas/rivers). Almost anything goes here as the French in this area will drink red wine with fish and will soak strawberries in it and drink the very sweet Sauternes chilled as an aperitif rather than with the pudding. The area is famous for oysters and the dry Graves white wines are a perfect accompaniment. The younger red wines are more full in flavour so compliment stronger flavoured food, but as the years go on, the wine becomes more refined and it would be a waste not to be able to appreciate the more subtle flavours with somewhat lighter food.